The rental business is a volatile one. It’s essentially just one step up from the hotel business as far as temporary housing goes. Tenants are constantly revolving in and out. This can be a lucrative business when dealing with long-term residential tenants, but when it comes to those short-term stays, like 3-6 months, the rental business for landlords could become quite costly due to installing new flooring all of the time. If you are trying to rent out residential apartments, potential tenants are expecting everything to be new. That includes the flooring. No one wants dirty floors, and if you expect a tenant to pay top dollar for your residential property, you’re going to need deliver a quality product. When it comes to apartments, a big majority of that will be the type of flooring. The first thing a tenant notices in a vacant apartment space is the floor. This can often make the difference on whether you’ll have an additional rental income that month or if you’ll be losing money. Making sure that you have quality flooring is vital in the rental business. While some landlords prefer to go the cheap route and install carpet, and depending on where the apartment building is located, even linoleum, other property owners are learning the value of investing in premium marble flooring. Marble tile is a strong and durable building material. Unlike carpet or linoleum, you won’t ever have to worry about replacing it. Marble is a type of stone. “Stone” being the operative word here, won’t rip or tear. It will withstand the toughest conditions. Also, marble just looks good! If you as a landlord started to install marble tile flooring in place of standard ivory-colored carpet, you’ll discover that choice renters will be willing to pay a premium price for such amenities. When you upgrade your residential apartment building with quality material, you significantly increase your chances of making more money than you would have with regular carpet and linoleum flooring. This is actually a good thing since marble tends to run a little high. The reason why marble is so expensive is because it is the top choice for most developers and contractors. Installing marble tiles into a build not only increases the property value, it entitles you as the building owner to charge top dollar for your apartment units. 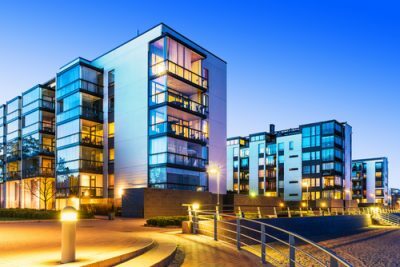 Oftentimes, you might even see a return on investment within the first year of renting provided that the unit is priced right. When it comes to surface finishings, there are a few options for marble tile. The most recognizable type is the polished finish. This is commonly seen in the interior of office buildings, schools, government buildings, shopping malls, and any place where there is a considerable amount of traffic. The polished finish reflects light that can brighten dim rooms and make tiny spaces feel larger. Its cool surface is ideal for warmer climates as well. The drawback to polished finishings in an apartment rental is that it will require buffing over a period of time. But much like how property owners may replace the flooring of carpet and linoleum, instead of spending the extra expense for new material and installation, you would just pay to restore the lustrous shine that it had when it was originally installed. When polished marble endures a high amount of traffic, it is possible for it to lose its luster. That is why it’s highly recommended to seal your marble floors every year in addition to buffing it. The sealant protects the surface from harsh scuffing that can occur with heavy traffic. Marble tile is indeed a long lasting material, but if you want it to retain a lustrous shine, certain treatment is recommended just like any other kind of building material. The ultimate trade-off here is that you only will have to install this of building material once. You won’t ever have to worry about it going out of style or not appealing to buyers. Marble tile in general has proven to capture the attention and awe of spectators across the world over the centuries. It will definitely withstand the test of time for the decorative taste of residential apartment tenants. Another type of finishing to use would be the honed finish. It you want to save yourself the extra step and time it takes to refinish the gloss on marble tile, opt for this type of finishing. This type has a matte surface. It does not reflect any light, but it provides a pastoral appearance that allows it to organically blend into the background allowing other decorative components to be the conversation piece. Here, landlords won’t have to worry about maintaining the marble’s sheen, but the same recommendation of treating with a sealant applies—especially for honed finished tile. Since the honed finish has a more textured looking surface, it is more susceptible to staining without the proper treatment. Marble tile is somewhat of a porous material to the point where if you spill dark liquids onto the surface, and the spill isn’t cleaned up immediately, you’ll find that your marble tile will have taken on a new look! If you plan to use marble tile in your residential apartment rentals, it is imperative that you educate your tenants on how to properly care for their floors. You don’t want new tenants to have stained marble floors. You want to keep your units consistent. That is why it is recommended to provide your tenant with a list of do’s and don’ts of how to care for your marble tile. Read Why You Should Seal Your Marble Floor to learn more about marble tile maintenance. Do you have any more questions about the kind of natural stone tile to install in your residential apartment building? Contact the knowledgeable natural tile wholesale distributors at Nalboor Tiles online or call 1-305-501-4548 today!